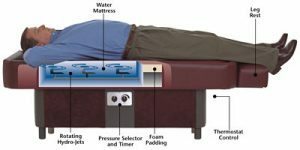 How Hydromassage Tables Work - Sidmar Manufacturing, Inc.
Hydrotherapy tables use flotation, heat and massage to produce therapeutic effects. The term hydrotherapy, by definition, refers to the use of water in the treatment of disease or trauma. In a broad sense, hydrotherapy includes water treatment utilizing any of the three natural forms of water; solid, liquid or vapor. The most common technique for hydrotherapy involves the use of the small whirlpool tanks. These tanks permit immersion within the agitated water of one or more extremities or the patient may sit in the tub. Larger therapy units (e.g., a Hubbard tank), incorporating larger whirlpools, can accommodate both a patient and a therapist. You simply lie back, completely clothed, on the table. Just under the surface is a mattress filled with heated water. A pump propels the warm water towards you through three patented hydro-jets. Each jet spins at nearly 200 revolutions per minute. A primary wave and a lighter, secondary wave combine to produce a very effective deep tissue massage to all areas of the spine simultaneously. The combination of flotation, heat and massage produce the therapeutic effects and are described below. Flotation: Water is extremely buoyant. When the body is placed on the water mattress, there is minimal strain on the weight-bearing joints. Additionally, few if any muscles are required to hold the body up or in position. These two conditions combine to help the patient’s body relax resulting in an increased physiologic response to treatment. Heat: Heat is evenly conducted through the skin and into the muscles and soft tissues of the body. The heat expands blood vessels, increases blood and lymphatic circulation, increases metabolism and has a sedative effect. Massage: The pressure of the water on the body increases venous and lymphatic flow. One of the effects of the resulting stimulation is increased molecular motion in the skin that may aid the healing process. Hydromassage helps works out trigger points in the muscles, which are localized areas of hyperirritability that induce a cycle of spasm, pain, tension, weakness and limited range of motion in the joints. Hydromassage focuses on the muscular system, the fascia, the circulatory and lymphatic systems or a combination of these body systems. Fascia is the connective tissue that attaches organs to organs, muscles to bones (tendons) and bones to bones (ligaments). The lymphatic system carries lymph, a clear or yellowish substance that flows throughout the body, filtering foreign matter and removing excess fluid, protein and waste products from the tissues and transporting them to the blood to be circulated and eliminated. Most of the time it will not be necessary to help people use the tables as nearly everyone can get on and off without help. However, since you might be dealing with people in pain, you may need to help those people get on and off the table. Have the person sit on the vinyl seat cushion, then have them rotate and put their legs on the foot rest and then lie back onto the water mattress. You can assist them by placing your left hand behind their back, hold their right hand with yours and gently lay them back onto the water mattress. Reach down to the control panel and twist the timer to the desired length of treatment and then select the desired massage intensity. The table starts as soon as the timer is twisted and automatically shuts off when the timer returns to 0. When the treatment is over, you should instruct the user to remain lying on the table for a moment. This allows the person’s sensory nerves to return to normal which helps restore their balance. If necessary, help the person off the table by placing your left hand behind their back, hold their right hand with yours and raise them off the mattress. They will then rotate and take their legs off the foot rest, place them on the floor and stand up. The temperature of the water is controlled by an electronic thermostat which is adjustable from 70° to 100° Fahrenheit. Although you can adjust the temperature of the water, you rarely will. Most users keep the temperature between 90°-100°. You just set it once and forget it. If you decide to change the setting, the thermostat is located under the seat cushion. Simply turn the dial to the desired temperature. You set the length of treatment with the timer located on the front of the table. You can set it from 3 minutes to 30 minutes and it will automatically turn off once the time has run out. In general, the average treatment lasts 10 to 15 minutes. The length of treatment ultimately depends on the level of spasticity and tension within the muscles, the level of pain affecting the person, how sensitive their muscles are and their personal preference. Use your professional judgement for each patient. The massage intensity on our Massage Time Pro model is adjustable from 12lbs. to 17lbs. of pressure. The intensity on the RejuvaWave model adjust from 2lbs. to 20lbs. You can create just the right sensation, from gentle and sooting to powerful and invigorating. You select the desired level by simply adjusting the control located on the front of the table. The value of the therapy is the same on any setting but the option helps accommodate the needs of each person. The massage can be used on nearly every part of the body by simply changing your position on the table. Select a suitable position based on the needs of each user. No matter which position is used, the user will receive the following benefits. Stimulating pressure points with massage and heat triggers the release of endorphins, which are neurochemicals that relieve pain. As a result, pain is blocked and the flow of blood and oxygen to the affected area is increased. This causes the muscles to relax and promotes healing. Massage focuses on relieving pain and discomfort as well as on responding to tension before it develops into “dis-ease”, that is, before constrictions and imbalance can do further damage. Massage enables the body to relax deeply. By relieving stress, it strengthens resistance to disease and promotes wellness. Massage stimulates the lymphatic system and helps hasten the elimination of toxins (e.g., lactic acid) from the body. Massage increases flexibility and range of motion, reduces inflammation, and increases joint mobility. It is used to relieve and even help prevent sports injuries. Massage improves muscle tone and circulation and helps relieve neuromuscular problems.